Newway Towing’s affiliate network of independent tow truck operators provide premium towing solutions, including 24/7 flatbed towing services. At Newway Towing, we take the safety of your property seriously — which is why we transport cars, trucks, motorcycles and other vehicles using the latest flatbed tow trucks. Flatbed towing is the safest option, as it involves placing your vehicle on the tow truck’s platform rather than lifting one end for the transportation process. As a result, all wheels rest directly on the platform and your vehicle will receive maximum protection from debris and other drivers while on the road. Our skilled technicians are highly-trained and experienced in flatbed towing. They will secure your vehicle to the truck and ensure it’s firmly positioned before starting their journey. Your car or truck can break down at any time, no matter how inconvenient it could be for you. You have places to be, work to do, people to meet: you can’t spare the time to wait around for help to arrive. Perhaps you’re heading to the airport or on your way to collect your kids from school. Perhaps you have a crucial business meeting or a flight to catch. Whatever the case, we aim to respond to every call within minutes. We have a large fleet of trucks on the roads of San Rafael, catering to drivers in all situations with minimal waiting times. Furthermore, we’re available round the clock: you can call Newway Towing for flatbed towing 24 hours a day, 7 days a week, 365 days a year. You’ll even be able to reach us during holidays — that’s how dedicated our team is to delivering the best service whenever we’re needed. Just pick up the phone and call Newway Towing: one of our flatbed towing technicians will be with you as quickly as possible. Fast Towing from a Team you can Trust! If you’re having a bad day, having an expert on the scene who knows exactly how to handle the situation makes a big difference. At Newway Towing, we take each call seriously and always provide a friendly, honest, helpful service. We’re passionate about being part of the local community and have become recognized for delivering the best flatbed towing in San Rafael. Each customer receives the same positive treatment from our technicians: we know just how helpful a courteous attitude is when you’re stranded by the side of a road waiting to be towed. You want to feel like you’re in good hands. And with Newway Towing, you are. Newway Towing’s licensed professionals deliver exceptional service at competitive prices. We aim to provide unbeatable flatbed towing for customers on all budgets, ensuring our expertise is always affordable for you. We’ll quote you a reasonable cost when you call us for flatbed towing, and this is what you’ll pay — there are no hidden charges or extras. 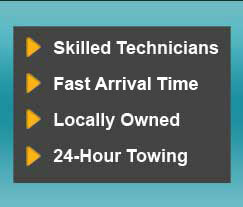 Newway Towing’s technicians are available for flatbed towing now. If you’re stuck at the side of a busy road or want to schedule a towing job, just give us a call 24/7 on (415) 870-3377!